« How many doctors are women? Polygraphs won’t catch leakers … say, what? Last week, AG Sessions announced a stepped-up effort to catch and prosecute leakers. The ACLU quickly hit the presses, arguing action against leakers was a threat against free speech and freedom of the press. We’re talking about classified government information, boys. Then, things heated up when Kelly Ann Conway hinted that suspected leakers might be subjected to polygraph testing. It’s not admissible in court … so the DOJ won’t be able to prosecute. Anybody remember the the Clinton private server investigation? All FBI employees sign standard form non-disclosure agreements (NDA) upon obtaining their security briefings, and they remain bound by those agreements throughout the course of their employment. In addition, the FBI asked agents working on the investigation of former Secretary of State Clinton’s use of a private e-mail server. to sign “Case Briefing Acknowledgment” which says the disclosure of information is “strictly prohibited” without prior approval, and those who sign are subject to lie detector tests. No one refused to sign the acknowledgement or raised any questions or concerns about doing so. This was not a unique circumstance … FBI employees may from time to time be asked to sign similar forms. I don’t recollect a lot of MSM whining about freedom of speech and freedom of the press. I guess that keeping the wraps on a Clinton investigation is right and proper … but leaks of, say, classified phone calls between the President and other world leaders need to be wide open for abuse. 1 . Require all persons with security clearances to sign an agreement comparable to the one used by the FBI in the Clinton investigation … specifically indicating that signers are subject to polygraph tests. No signature, no job, no exceptions. 2. 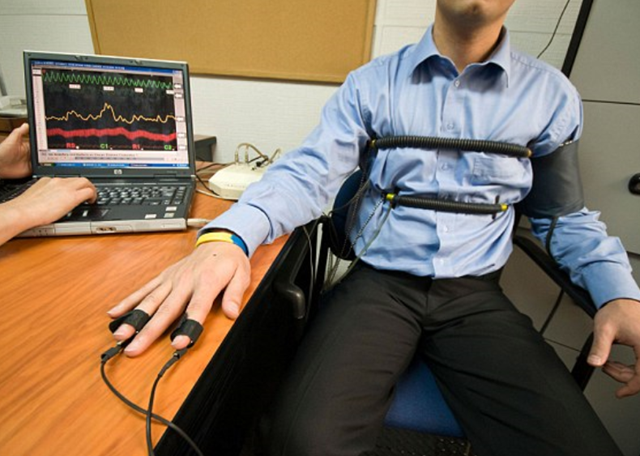 Dust-off the polygraphs and start with the equivalent of MLB – NFL random drug tests. Start with the higher pay grades and work your way down. If it works for pro sports, why wouldn’t it work for government employees? 3. Require that ALL security clearances be renewed over the next year or two … and require a polygraph for all renewals. Forget the cost, we’re talking about national security. 4. Offer whistleblowers protection and substantial rewards for ratting out a leaker … i.e. providing leads and evidence for the prosecution of perps. 5. Throw the book at leakers when they are identified. A few quick convictions will instill some religion with the masses. If they want to stop the leaks, they can! This entry was posted on August 7, 2017 at 6:51 am and is filed under Leaks -Leakers, National Security, Polygraphs - Lie Detectors. You can follow any responses to this entry through the RSS 2.0 feed. You can leave a response, or trackback from your own site. A better idea – let’s start with 45 and his VP taking polygraphs! And then let his cabinet take polygraphs, too – to verify whether they told any lies and untruths in their congressional confirmation hearings!